A dog can provide companionship for many years. So, when you decide to add a dog to your family, it is important to take the time to find the ideal dog. Dogs come in all shapes and sizes, and choosing one that will fit in with your family and lifestyle can be a difficult task. Many purebred dogs were developed to perform a specific type of work. There are breeds that herd stock, guard, aid hunters in the field, and there are even dogs that work to keep the barn free from vermin. If you are thinking about getting a purebred dog, it is imperative you understand what type of work a breed was developed for. Many times a dog's behaviour and reaction can be directly related to its genetic makeup and instincts. For example, a breed used to herd stock will love to chase, and the breed developed to guard may have a strong tendency to become very possessive. Both of these types of dogs may require special training in order to grow into well-mannered and trusted companions. 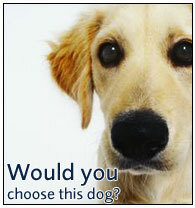 In your search for the perfect dog, you will find it helpful to identify characteristics inherent to different breeds. Narrow your search down by being able to recognise and decide what temperaments and tendencies of a breed best fit your family and lifestyle. Here are some examples or questions to ask yourself that will help you choose a dog that is best suited to your household. Will your dog spend time with children? If so, it would be a good idea to stay away from those breeds known to have strong guarding and herding instincts. Dogs that want to guard, possess and chase are not a good match for households with children. How much exercise will your dog receive daily? A dog whose parents were bred to work all day hunting or herding may require a great deal of exercise on a daily basis in order to live peacefully in your home. .
How often to you plan to groom your dog? Some breeds have long hair or a dense hair coat that requires daily brushing. Other dogs need to visit a professional groomer once every four to six weeks for coat maintenance. 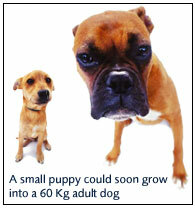 It is important to remember that a small puppy could grow into a 60 kilo adult dog. Choose a dog that you will feel comfortable handling when it is mature. Should you select a puppy or an adult dog? Puppies require a lot of extra time, patience, socialisation and training in order to become well-mannered and well-adjusted adults. This new demand on time may be difficult for some families, especially those with small children. Many times an older dog is already housebroken and is past the chewing stage, and will require less time and training than a young puppy. After you have taken the time to choose the type of dog best suited for you and your family, use these helpful guidelines to select the ideal dog or puppy. When choosing a puppy be sure to see at least one of the parents. Most often the personality and tendencies exhibited by the puppy's parents will be seen in the puppy as it matures. Look for a friendly and outgoing dog or puppy. This is the one that happily approaches, wants to be with you and calmly accepts petting. Choose a puppy that has been raised in a neat and clean environment. For example, puppies from pet shops often are difficult to housebreak and have a hard time getting used to life in a home environment. Do not select a pup or dog that is shy or clingy. Dogs and puppies with these tendencies have a very difficult time adjusting to life in a busy household. When you decide to add a dog, take the time and effort to find the perfect dog for you and your family. Choosing the right dog is the first step in having a pet that will grow into a wonderful and cherished companion for many years to come.